Be the first to share your favorite memory, photo or story of Osborne. This memorial page is dedicated for family, friends and future generations to celebrate the life of their loved one. Mr. Osborne Pinto, 74, of Tucker, Georgia, passed away on Wednesday, April 3, 2019 at Emory University Hospital. Mr. Pinto was born in 1944 in Bombay, India, son of the late Stanislaus Pinto and Olinda Lewis Pinto. He was an accountant and worked for Emory University for many years. After retiring from Emory he ran a small bookkeeping and tax services business. In addition to his parents, he was preceded in death by a brother, Ronald Pinto. 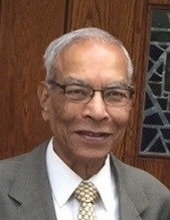 Survivors include his wife Sidna Pinto; sons and their families, Vijay Pinto and his wife, Leslie and their children, Matthew and Christopher; Sanjeev (Stan) Pinto and his wife, Darcy, and their children, Gavin, Lillian, and Maya; Avi Pinto and his wife, Judy, and their children, Miles, Emilia, and Adelaide; a brother, Geoffrey Pinto and his wife Cathy, and their children; a sister-in-law Iris Pinto and her children; and extended family members. The family will gather at A.S. Turner and Sons Funeral Home in Decatur to receive friends from 6 to 7:30 p.m. on Friday, April 5, 2019. The rosary will be said at the funeral home at 7:30 p.m. A funeral mass will be held 1 p.m. Saturday, April 6, 2019 at Our Lady of Assumption Catholic Church with Father Jim Duffy, SM officiating with a reception immediately following mass at the church in Moylan Hall. The committal will be in Melwood Cemetery at 5 p.m. on Saturday. **In lieu of flowers, memorials may be made to Catholic Relief Services or the charity of your choice. To send flowers or a remembrance gift to the family of Osborne Pinto, please visit our Tribute Store. "Email Address" would like to share the life celebration of Osborne Pinto. Click on the "link" to go to share a favorite memory or leave a condolence message for the family.